If we had a penny for every time we saw a badly cooked steak we’d probably be millionaires. There are certain cardinal tips you have to follow for a perfect result: 1) Allow your steak to come up to room temperature before you cook it 2) Get your frying pan super hot before your steak goes in and 3) Make sure you rest the steak on a warm plate for a few mins after cooking before you cut into it. Right, now you’re ready! First you need to take your steak out of the fridge to bring it up to room temperature. Pre-heat your oven to 220 degrees and boil 300ml of water for later. Chop your potatoes into small 2cm cubes. 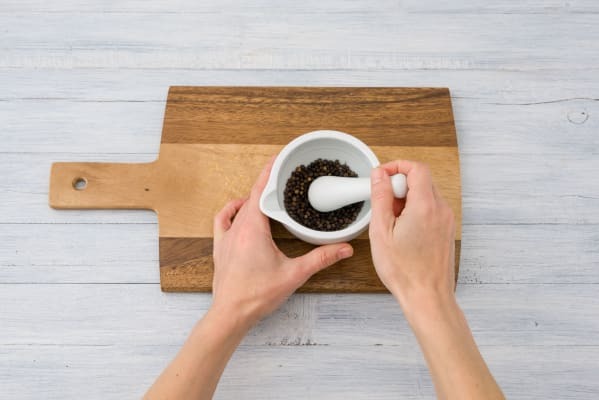 LH: Lightly crush your peppercorns in a pestle and mortar. Tip: If you don’t have a pestle and mortar put them between two sheets of foil/clingfilm and give them a little whack with a rolling pin. Remove the rosemary leaves from the stalks and very finely chop. 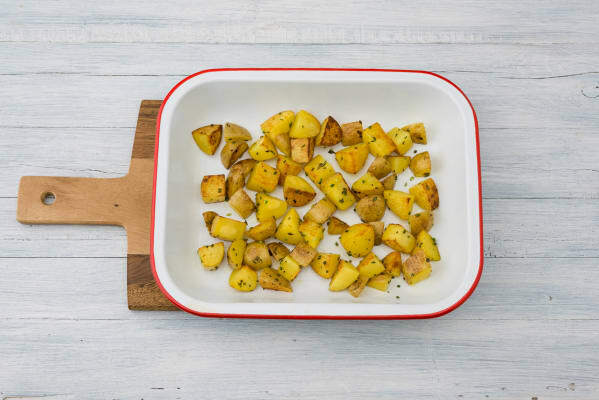 LH: Put your potatoes on a baking tray, sprinkle over the chopped rosemary leaves and drizzle over 3 tbsp of olive oil.Sprinkle over ½ tsp of salt and a good grind of pepper. Give the baking tray a good shake so the potatoes are evenly coated and cook on the top shelf of the oven for 30 mins until crispy (shake occasionally). Peel and very finely chop the shallot and cut your broccoli into florets. 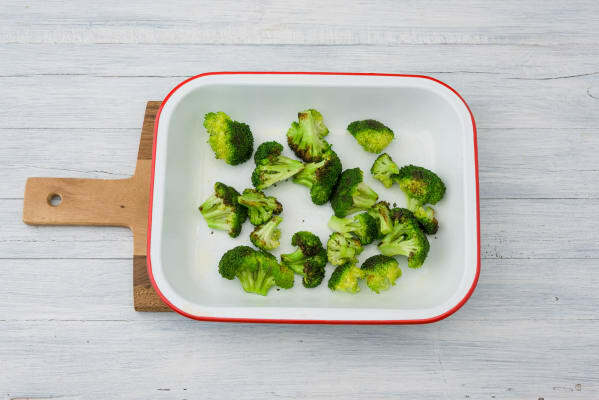 Put your broccoli florets on a baking tray, add 2 tbsp of olive oil, ½ tsp of salt and a good grind of pepper and pop in the oven for 15 mins until slightly crispy. Once the steak has come to room temperature, season it with a pinch of salt. Heat a large frying pan on high heat with 2 tbsp of oil. 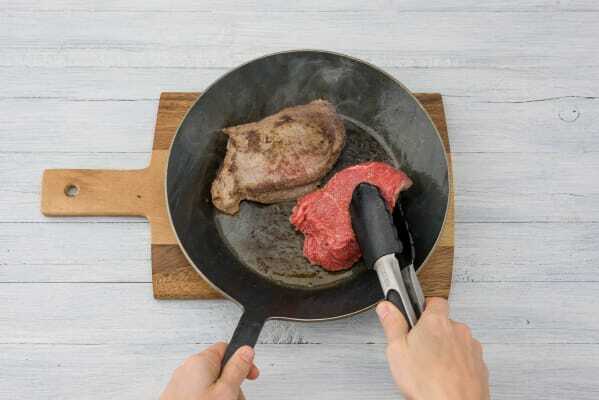 Once almost smoking hot, lay the steak into the pan and press it down.Tip: Lay the steak away from your body to stop oil spitting at you. Cook the steak for 2 mins on each side for medium rare or 3 mins each side for medium. Only turn the steak once and rest on a warm plate once cooked. Tip: Cover the steak with tin foil to keep warm whilst you finish off the rest. Once the steak is removed from the pan, turn the heat to medium low and add 4 tsp of olive oil to the pan along with the chopped shallot. After cooking for 2 mins, add the peppercorns. One minute later, add your 300ml of boiled water and stir in the stock pot. Bubble away for a few mins and once the sauce has reduced by half, take off the heat and stir in the crème fraîche. Tip: For a decadent touch, add 2 tsp of butter at this point (if you have any). 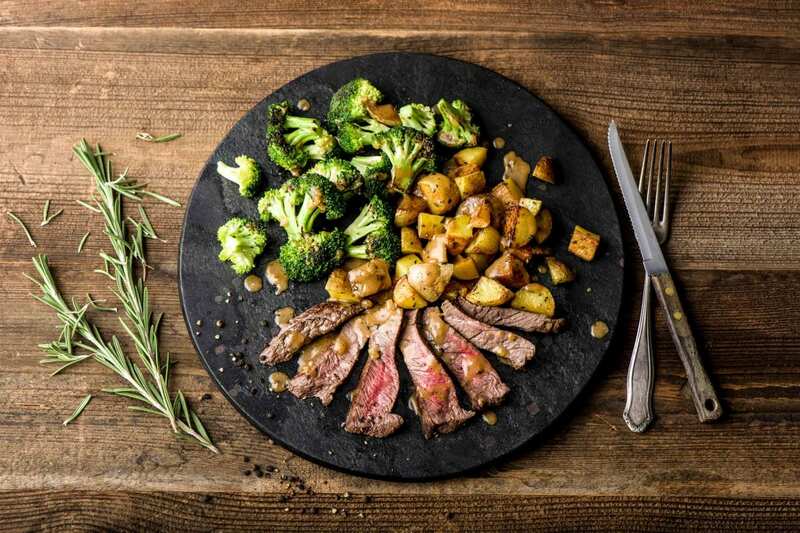 Slice your steak diagonally into 1cm strips and serve with your homemade peppercorn sauce, potatoes and broccoli.